Roxy Womens Snowboard - Ally BTX - Soft True Twin, All Mountain - 2017. Roxy Ally Womens Snowboard 2017. The Ally is an easy going board for anyone who wants to have fun on the mountain. With its soft flex and easy going reverse camber shape it is a catch free fun board with magnetraction edges to grip on hard snow and ice. 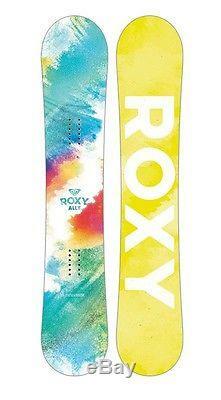 A great board for anyone looking to press and butter around, zoom round the pistes or get their teeth into some powder. Order before 3pm for Same Day Dispatch. This product has no reviews yet, however see what our buyers say about our other products.. We therefore recommend you supply us with a deliver address where there will be someone in to sign for the goods and also a contact telephone number. Unless otherwise agreed, we also do not deliver on Saturdays or UK Bank Holidays. Arrangements can be made if you require your goods urgently, however, there may be a significant increase in cost based on the courier tariffs. Please note if ordering on a Friday, you order may not be delivered until the Monday or Tuesday of the following week. The Board Basement can deliver products below 2kg weight to anywhere in the world. If you need anything quickly or delivered somewhere not covered, please feel free to drop us a line. Where a genuine attempt or attempts have been made to deliver an item without success, the parcel can be re-delivered at your expense. We will always endeavor to ensure you receive the parcel as soon as possible. To guarantee that you receive your order in time, you should make sure that you. You can give us your work address or an alternative address, where you know someone can sign for the parcel if you won't be available at the billing address. Use the tracking / consignment number that we send to you after the order has been dispatched. No one was home to sign for the parcel or if the driver was unable to locate the address. You can then contact the courier to arrange for a redelivery or solve any issues in terms of your specific order. How to return a product. In all circumstances, you will be responsible for the item or items until they reach us. Please include the original invoice that was included with the product(s). If you do not have these details available then pass on as much information as possible on a covering letter. The Board Basement online snowboarding store was born out of a simple idea - help people fight against the growing cost of doing what we love to do. We are small company but we are all keen snowboarders so we understand what is important - quality gear and great prices. We also have new in season stock for products that always sell out. So we are continually searching and finding the best deals around and then passing them directly on to you, our customers. The everchanging opportunities that come our way mean that where something may not be available one week, it is the next, so please keep in touch. Every week and most days we load new products. The idea came out of another successful business we created called Urban Surfer based in Exeter, Devon; Urban Surfer was well known and respected, not just locally but across the UK and Europe. With this comes over 20 years experience in the Snow and Surf industry as well as years of being boarders ourselves. This means we have a stack load of contacts to get the best deals for you. Treating customers, as we would like to be treated ourselves is one of key beliefs and the foundation of our customer service. If you live in Exeter, or the South West of England please feel free to come and visit the warehouse to see/try our Snowboards, Snowboard Boots, Snowboard Bindings, Ski Snowboard Goggles, Ski Snowboard Gloves, Skate Shoes, Dakine luggage and backpacks, Sanuks or any of our other products. You may also be interested in.. The item "Roxy Womens Snowboard Ally BTX Soft True Twin, All Mountain 2017" is in sale since Thursday, December 22, 2016. This item is in the category "Sporting Goods\Skiing & Snowboarding\Snowboarding\Snowboards". The seller is "theboardbasement" and is located in Exeter, United Kingdom. This item can be shipped worldwide.